A few years ago, Toyota introduced their Star Safety System – a combination of five systems designed to work together to keep you safe. Today, every SUV that Toyota sells is equipped with this system; a very smart move. So what exactly does the Star Safety System include, and why do you need it to keep you and your family safe? When you’re driving under slippery conditions, your tires have a tendency to lose traction with the road, especially when you’re turning. 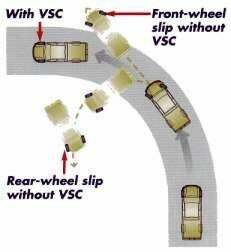 Without stability control, front-wheel slip can easily occur around a turn. When this happens, your front tires lose traction with the road and your vehicle careens forward, towards the outside of the turn. Rear-wheel slip happens when the rear wheels lose traction and will cause your vehicle to slide sideways out of your lane. VSC constantly sits in the background, monitoring two things: steering angle and direction of travel. When it senses that the steering angle no longer corresponds with the direction of travel (you aren’t going the way you’re telling the car to go,) the VSC kicks in, reducing engine output and applying brakes to individual wheels as necessary. Traction Control is very similar to VSC in the sense that it reduces output and applies individual brakes upon sensing loss of traction, but the difference lies in the way that it monitors the traction and how it applies the correction. 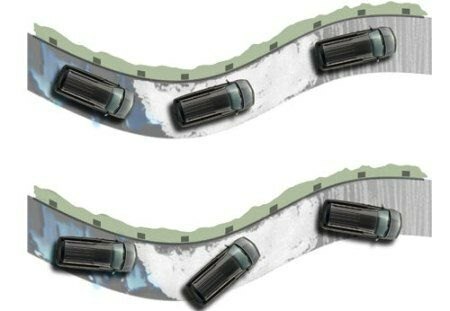 Traction Control simply monitors wheelspin. Let’s say you’re backing out of your driveway and hit a small patch of ice. Traction Control will slow the engine and apply brakes to that wheel to stop spinning, sending torque to the other wheels to continue on your way without sliding. Imagine you’re driving down the highway behind a large truck, and some cargo falls out on to the road ahead of you. Instinctively, you slam on the brakes and try to swerve out of the way. Without ABS, your wheels lock up, lose traction, and you begin to slide, making matters worse. With ABS however, you remain in control, swerve out of the way, and miss the fallen item. ABS senses when you hit the brakes hard, and effectively “pumps” the brakes much faster than any human could possibly pump them. This pumping keeps the wheels from locking up, and slows the vehicle much faster. EBD basically senses the weight distribution in the vehicle, and applies the brakes in accordance to minimize forward tilt. For example: you’re driving along with some heavy cargo or passengers in the back and must come to a quick stop. Without EBD, you apply the brakes and the vehicle tilts forward, reducing the effectiveness of the rear brakes and sliding the cargo forward. With EBD, the system senses that there is extra weight in the rear, applying more braking to the rear wheels, helping to keep the vehicle balanced and even. Brake Assist was designed to have you never notice that it’s there. If you are in an emergency braking situation and slam on the brakes, you may not apply all of the braking pressure needed to avoid the accident. Maybe you have the seat too far back or just didn’t push the pedal down all the way. That’s where Brake Assist comes in, applying more braking pressure under a panic stop to help you avoid your collision. 1 Comment on "Toyota’s Star Safety System"